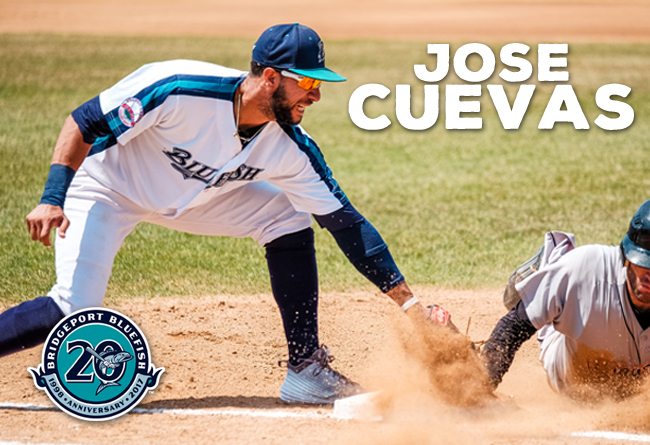 (Bridgeport, Conn., Feb. 28, 2017) – The Bridgeport Bluefish today announced that infielder Jose Cuevas will return to Bridgeport for the 2017 season. Jose Cuevas returns to the Park City for his second season in the Atlantic League and eighth of professional baseball. Last year with the Bluefish, he hit .286 with ten home runs, 65 RBI, 65 runs scored and four stolen bases. He was also selected to participate in the 2016 Atlantic League All-Star Game, which was held in Lancaster, PA. The 28-year-old made his professional debut in 2010 after being drafted by the San Francisco Giants in the 29th round of the MLB draft. He spent three years in the Giants organization, reaching as high as Triple-A in 2011. Before coming to Bridgeport in 2016, he spent the previous three seasons in the Can-Am League with New Jersey and Trois-Rivieres. In 590 career minor league games, Jose owns a .270 batting average with 48 home runs, 304 RBI, 359 runs scored, and 85 stolen bases.